To create a Java program with a graphical user interface (GUI), you'll want to learn about Swing. The Swing toolkit includes a rich set of components for building GUIs and adding interactivity to Java applications. Swing includes all the components you would expect from a modern toolkit: table controls, list controls, tree controls, buttons, and labels. Swing is far from a simple component toolkit, however. It includes rich undo support, a highly customizable text package, integrated internationalization and accessibility support. To truly leverage the cross-platform capabilities of the Java platform, Swing supports numerous look and feels, including the ability to create your own look and feel. The ability to create a custom look and feel is made easier with Synth, a look and feel specifically designed to be customized. Swing wouldn't be a component toolkit without the basic user interface primitives such as drag and drop, event handling, customizable painting, and window management. Swing is part of the Java Foundation Classes (JFC). The JFC also include other features important to a GUI program, such as the ability to add rich graphics functionality and the ability to create a program that can work in different languages and by users with different input devices. The following list shows some of the features that Swing and the Java Foundation Classes provide. 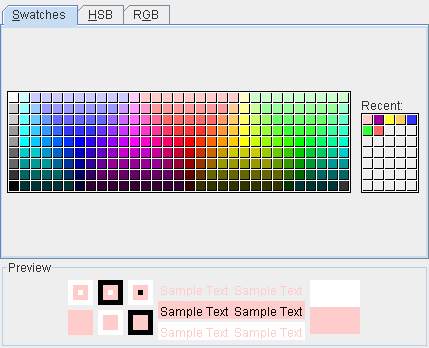 The Swing toolkit includes a rich array of components: from basic components, such as buttons and check boxes, to rich and complex components, such as tables and text. Even deceptively simple components, such as text fields, offer sophisticated functionality, such as formatted text input or password field behavior. 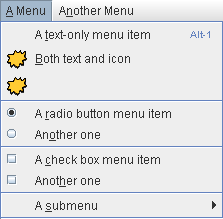 There are file browsers and dialogs to suit most needs, and if not, customization is possible. If none of Swing's provided components are exactly what you need, you can leverage the basic Swing component functionality to create your own. 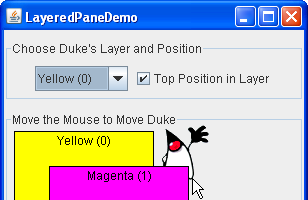 To make your application stand out; convey information visually; or add figures, images, or animation to your GUI, you'll want to use the Java 2D API. Because Swing is built on the 2D package, it's trivial to make use of 2D within Swing components. 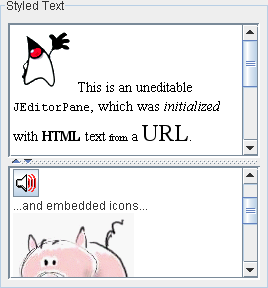 Adding images, drop shadows, compositing — it's easy with Java 2D. Any program that uses Swing components has a choice of look and feel. The classes shipped by Oracle provide a look and feel that matches that of the platform. The Synth package allows you to create your own look and feel. The GTK+ look and feel makes hundreds of existing look and feels available to Swing programs. A program can specify the look and feel of the platform it is running on, or it can specify to always use the Java look and feel, and without recompiling, it will just work. Or, you can ignore the issue and let the UI manager sort it out. Data transfer, via cut, copy, paste, and drag and drop, is essential to almost any application. Support for data transfer is built into Swing and works between Swing components within an application, between Java applications, and between Java and native applications. This feature allows developers to build applications that can interact with users worldwide in their own languages and cultural conventions. Applications can be created that accept input in languages that use thousands of different characters, such as Japanese, Chinese, or Korean. 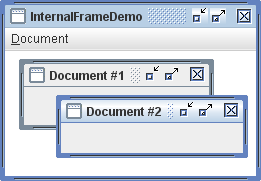 Swing's layout managers make it easy to honor a particular orientation required by the UI. For example, the UI will appear right to left in a locale where the text flows right to left. This support is automatic: You need only code the UI once and then it will work for left to right and right to left, as well as honor the appropriate size of components that change as you localize the text. People with disabilities use special software — assistive technologies — that mediates the user experience for them. 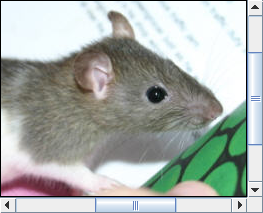 Such software needs to obtain a wealth of information about the running application in order to represent it in alternate media: for a screen reader to read the screen with synthetic speech or render it via a Braille display, for a screen magnifier to track the caret and keyboard focus, for on-screen keyboards to present dynamic keyboards of the menu choices and toolbar items and dialog controls, and for voice control systems to know what the user can control with his or her voice. The accessibility API enables these assistive technologies to get the information they need, and to programmatically manipulate the elements that make up the graphical user interface. Swing's undo framework allows developers to provide support for undo and redo. Undo support is built in to Swing's text component. For other components, Swing supports an unlimited number of actions to undo and redo, and is easily adapted to an application. For example, you could easily enable undo to add and remove elements from a table. If you want your program to run within a browser window, you can create it as an applet and run it using Java Plug-in, which supports a variety of browsers, such as Internet Explorer, Firefox, and Safari. If you want to create a program that can be launched from a browser, you can do this with Java Web Start. Of course, your application can also run outside of browser as a standard desktop application. This page shows Swing components in the Java look and feel. 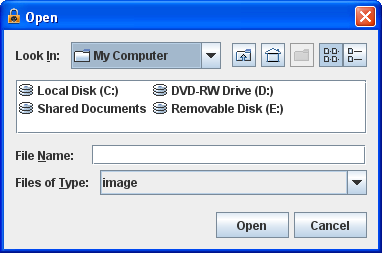 The following page shows the same components in the Windows look and feel. Simple components that are used primarily to get input from the user; they may also show simple state. These components display highly formatted information that (if you choose) can be modified by the user. These components exist solely to give the user information. At least one of these components must be present in any Swing application. These general-purpose containers are used in most Swing applications. These special-purpose containers play specific roles in the UI.